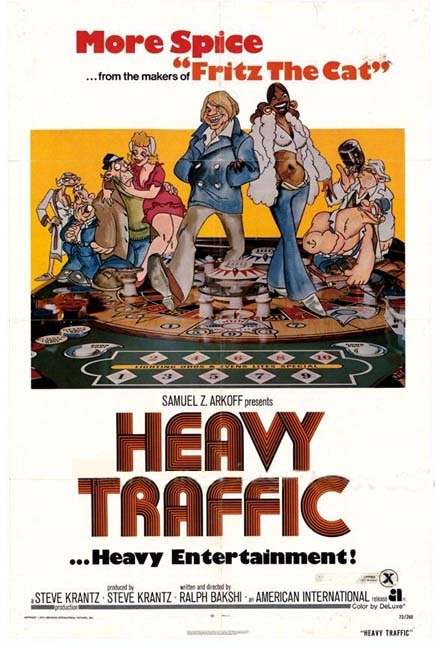 Heavy Traffic (1973, USA) is a Animated film directed by Ralph Bakshi. More Spice from the makers of Fritz the Cat! It's animated, but it's not a cartoon. It's funny, but it's not a comedy. It's real. It's unreal. It's heavy. The amorous life and misadventures of a virginal young pinball player...his Chicks...his Chums and a host of assorted weirdos in all colors. This page was last modified on 19 April 2019, at 14:46.